…typicalness is the unbreakable bond between a wine and its land. Here it is San Severo with its two souls: one is monumental, religious with the Benedectine monastery, wrapped up in an atmosphere of ancient , mystical sweetness, and the Celestine mansion, the Episcopate, the little church of the “La Pietà”, enveloped in elegant ornaments with its streets that flow outwards in all directions. The other is that of wine. Gradually, as one goes further away from the centre, the wine smell rises up uninterruptealy, coming out of dark arkades and the gratings of large windows; …and while going towards the long stretches of vines on the ondulations of the land that slope down to the heart of this magnificent zone , you may meet hosts pouring this delicious wine into your glass. (from “La Puglia dell’uva e del vino” – V. Buonassisi, B. Del Monaco, C. Liuni – Bari 1983). The former monastery, built around the year 1350, includes the Town Hall and the church of SS. Trinity. Starting from the symbols of the Celestini order, in various parts of the former convent and church, we go to the Banner representative present in the Town Hall. 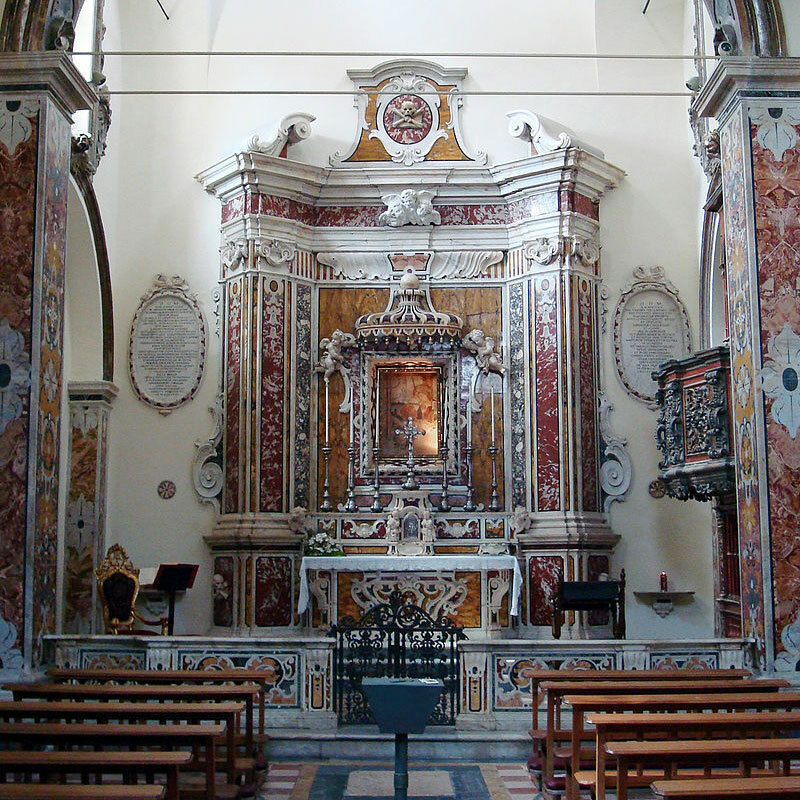 The entire complex was destroyed by the earthquake of 1627 and was rebuilt by the Abbot Giuseppe MariaTurco, whose remains are preserved in this tomb in the church in the eighteenth-century organ. The church of late medieval origins , preserves, alongside medieval remains limited, remarkable eighteenth-century paintings, important works of Neapolitan artists Alessio D’Elia, Santolo Cirillo and Giovanni Maria Mollo, and prestigious Neapolitan baroque marble, like the great balustrade, realized by Gennaro De Martino in 1755-56, and the high altar, designed by Lorenzo Mosca and realized by two pairs of marble artisan (Greco and Palmieri, Troccoli and Tipaldi) between 1750 and 1754. The current facade of uncertain eclectic taste, date back 1872, while the big bell tower, restored in 2006, is eighteenth century. 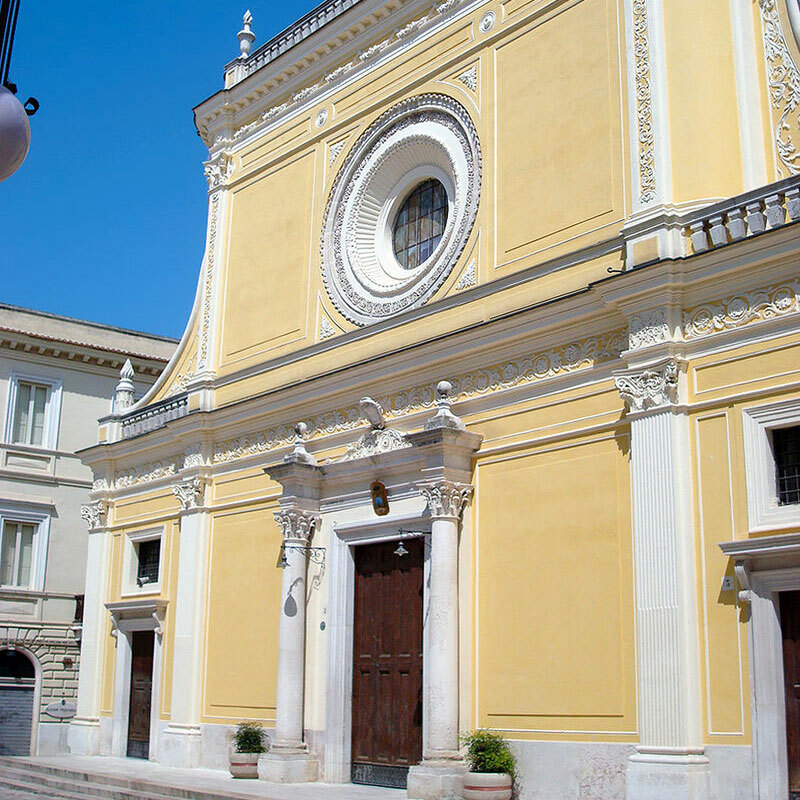 The church of Santa Maria della Pietà, a national monument, is a small but important Catholic place of worship of San Severo. It is also called Church of the deads (referred to the souls in Purgatory), as entrusted in 1707 eponymous lay congregation, the oldest of the currently active congregations, also called dei Nobili (today Confraternity of Prayer and Death of Our Lord Jesus Christ), founded in 1580 canonically erected in 1693 (scored the royal assent in 1758). 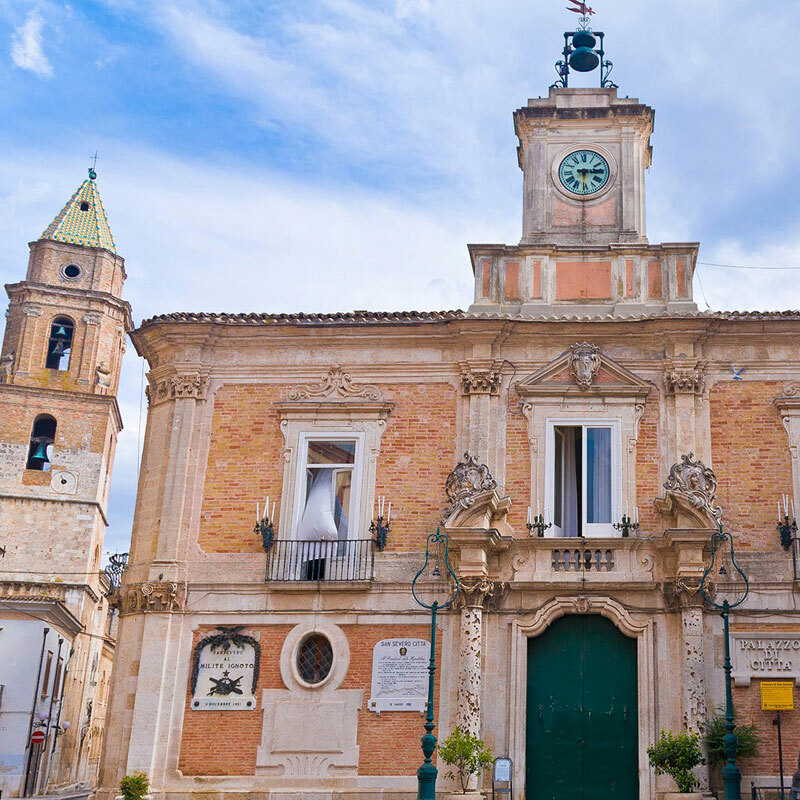 It is one of the greatest Baroque monuments in the region. It was built in its present form in the early eighteenth century. – naturally who once compared it to a lily?